With equities closing moderately lower, the VIX settled higher for the second consecutive day, +6.7% @ 15.51 (intra high 15.88). Near term outlook is for the sp'2060/50s, which should equate to VIX 18/20 zone. 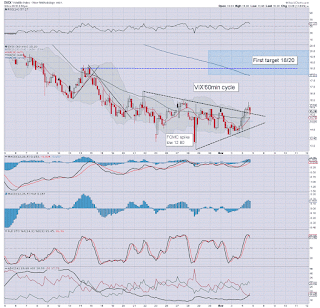 Even if sp'2020s, sustained action >25 looks out of range. 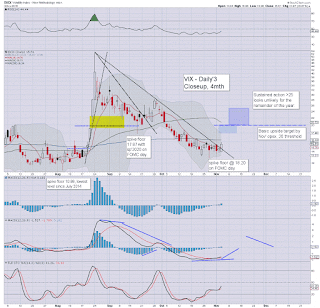 Arguably.. today saw a provisional breakout for the VIX, as seen on the hourly chart. The 18/20 zone looks due.. as early as this Friday. 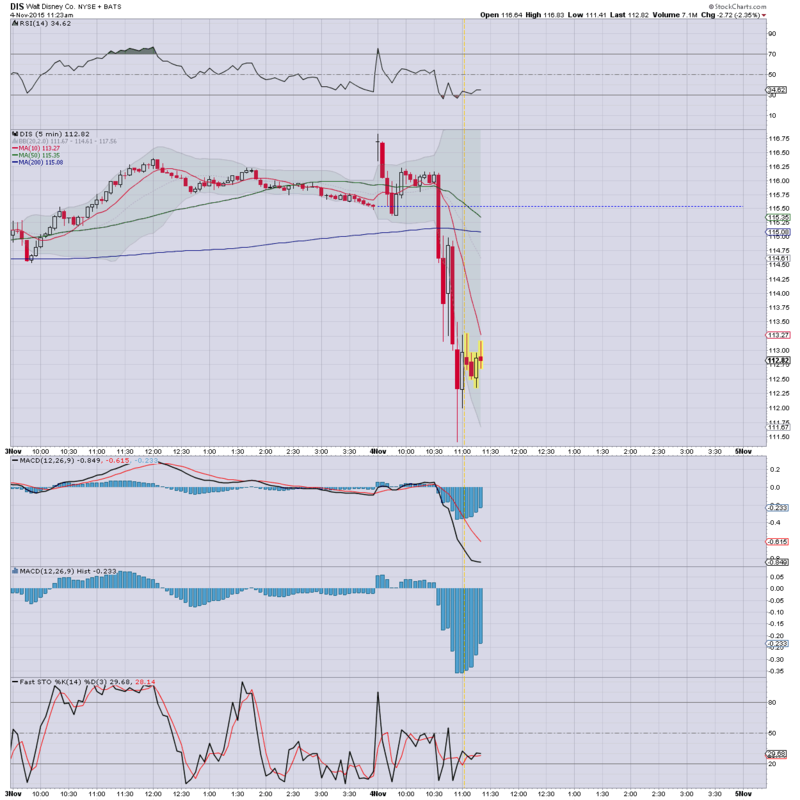 Things would get marginally exciting with sp'2020s.. that might equate to VIX 23/25 zone... for a 'few hours'. *closing hour action: micro chop... leaning on the downside. Certainly, a far more interesting day than yesterday, with the first opportunity of sig' downside this coming Friday. 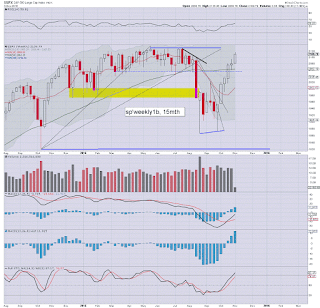 A weekly close in the 2060/50s, along with VIX 18/20, would offer hope of a retrace that will last a good 7-8 days. 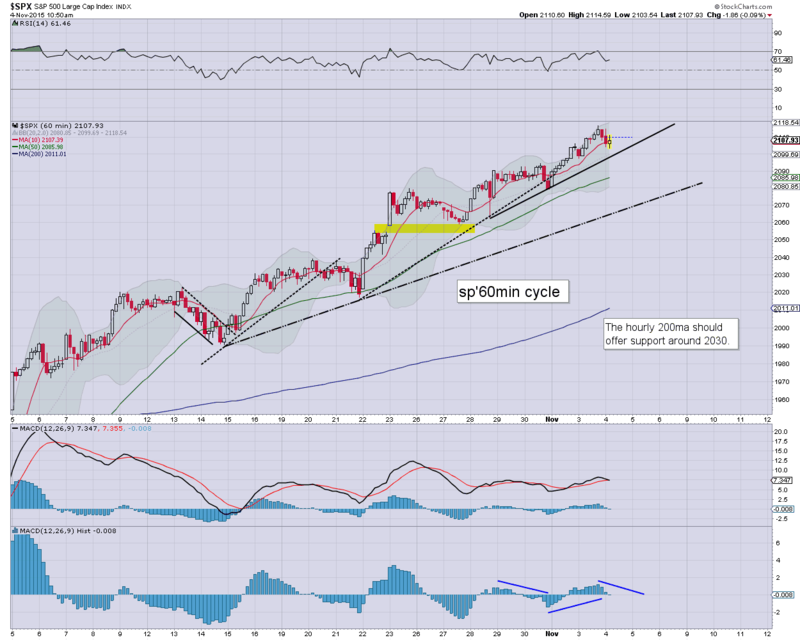 On no realistic outlook though does sustained action look viable under the giant sp'2K threshold. US equity indexes are set to close a little lower, but clearly, nothing significant.. with first realistic opportunity for a -25/30pt day this Friday. VIX is holding onto gains of around 4% in the low 15s. Metals are lower for a sixth consecutive day, with Gold -$9, and Silver -1.1%. Oil is -3.0% in the $46s. Price action is clearly still very choppy.. and for now.. there is little to expect until Friday morning. notable strength: NFLX, TSLA... the latter remains a corporate joke, having posted yet another lousy earnings report. Hell, at least NFLX posted a profit.. if fractional (along with help via some accounting tricks). Earnings due at the close... FB... and WFM. US equities are moderately lower, with underlying price momentum continuing to swing back toward the equity bears. 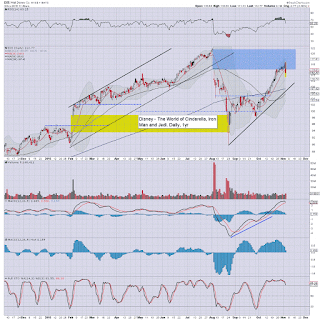 At the current rate, the daily MACD cycle will see a bearish cross this Friday, and that will offer a weekly close in the sp'2060/50s.. along with VIX 18/20. 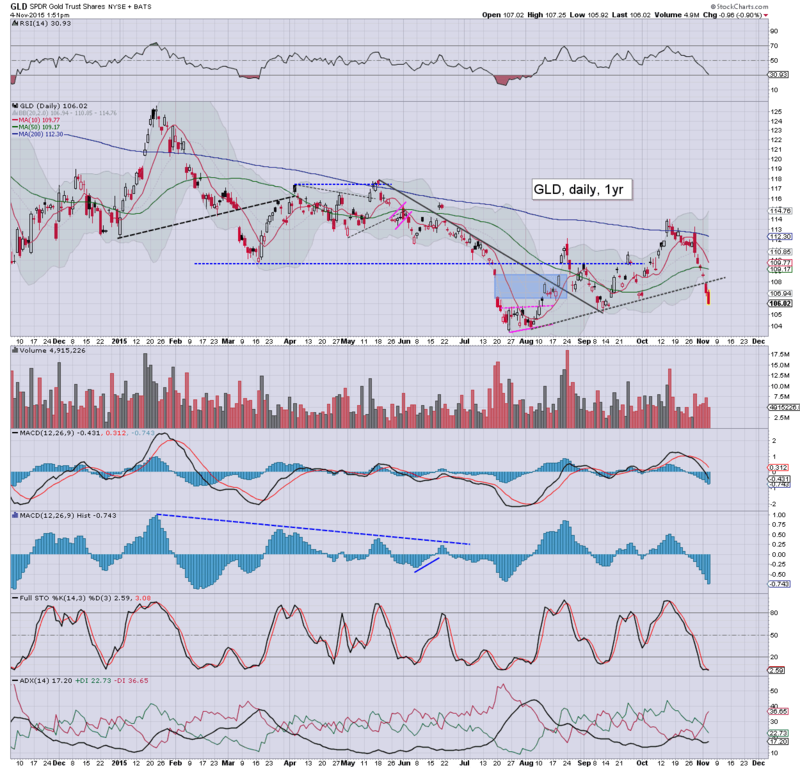 re: metals.. Day'6 down for Gold/Silver... as key support was broken yesterday morning. Clearly, continuing media/trader chatter of Dec' FOMC rate hike is not helping. 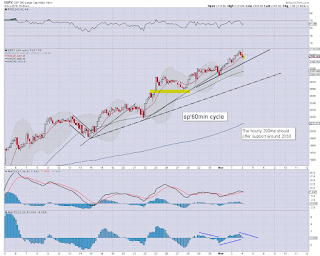 As for the broader equity market.. it would seem we have a cycle high of sp'2116. 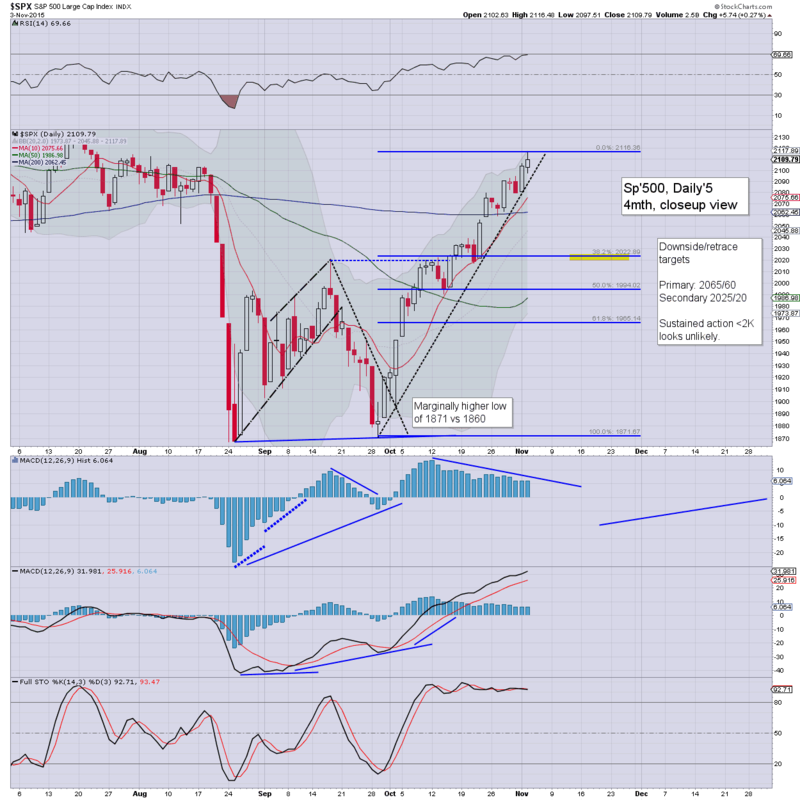 A retrace to the 200dma.. and probably the 50dma look due... although the latter is out of range until late next week... at which point we could be somewhere close to 2020.
notable weakness, Oil, -3.2%, as once again, the market is reminded that the supply issue is NOT resolved. Fed official Dudley is due to hold a press conf' at 2.30pm on 'economic outcomes'.. although I'm entirely unaware if clown finance TV will be covering it. Vice chair Fischer is set to speak AH.. and Mr Market will certainly be listening to that. 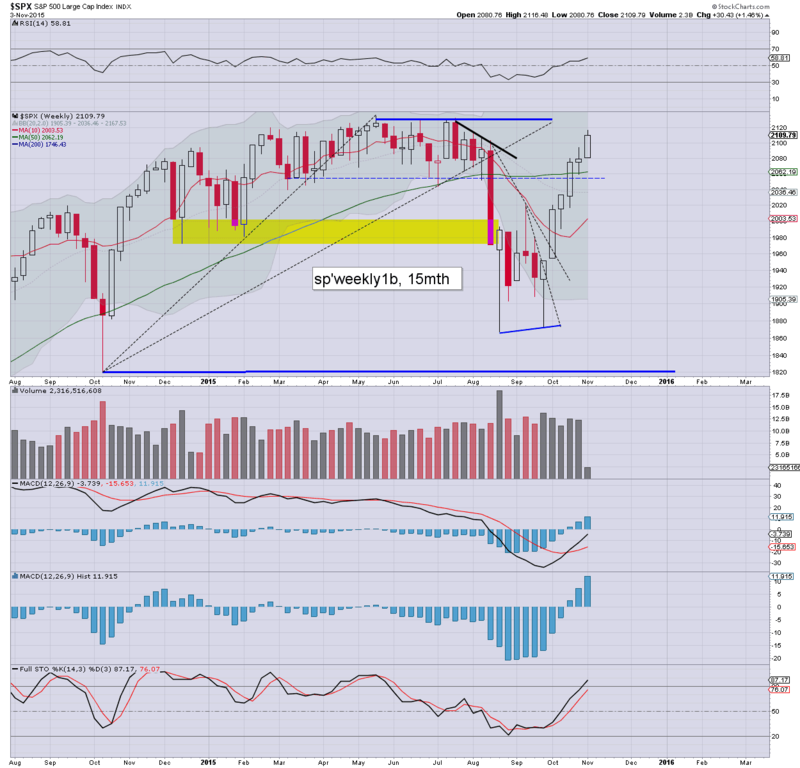 US equity indexes remain moderately weak... if somewhat choppy. 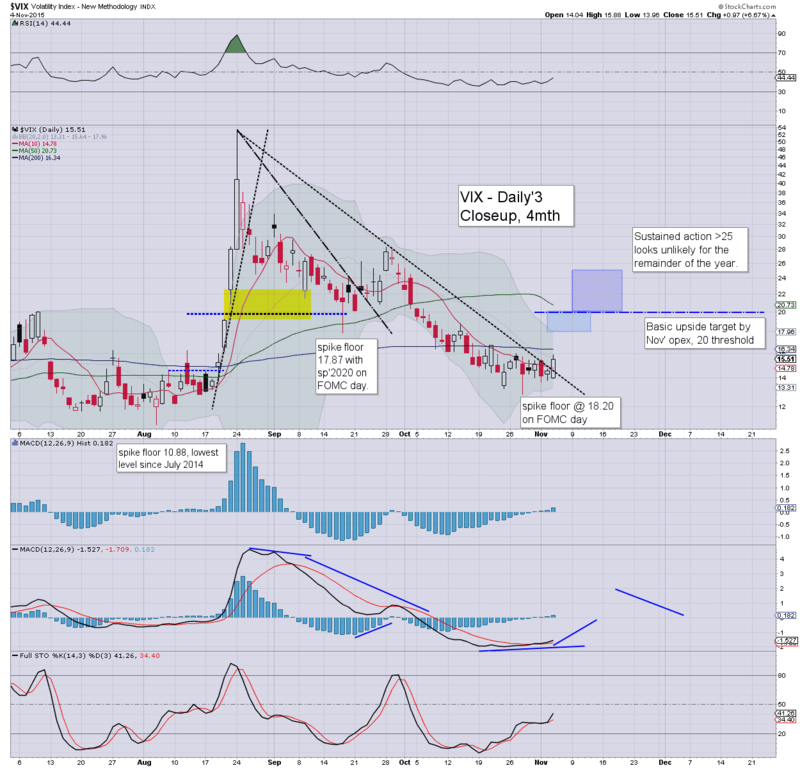 VIX has broken outside of a rather bullish price structure.. with the 18/20 zone seemingly on track by the weekly close... which would equate to sp'2060/50s. Meanwhile.. DIS remains notably weak, -3.3%. re: DIS. 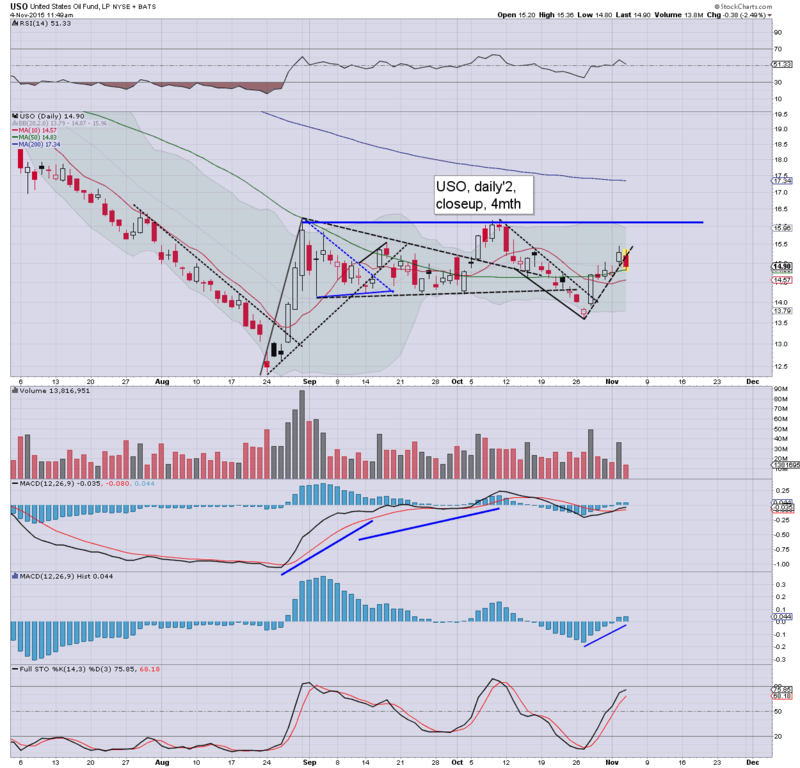 bearish engulfing candle in DIS. There is easy downside to 108/105.... after that.. the $100 threshold. To be clear.. 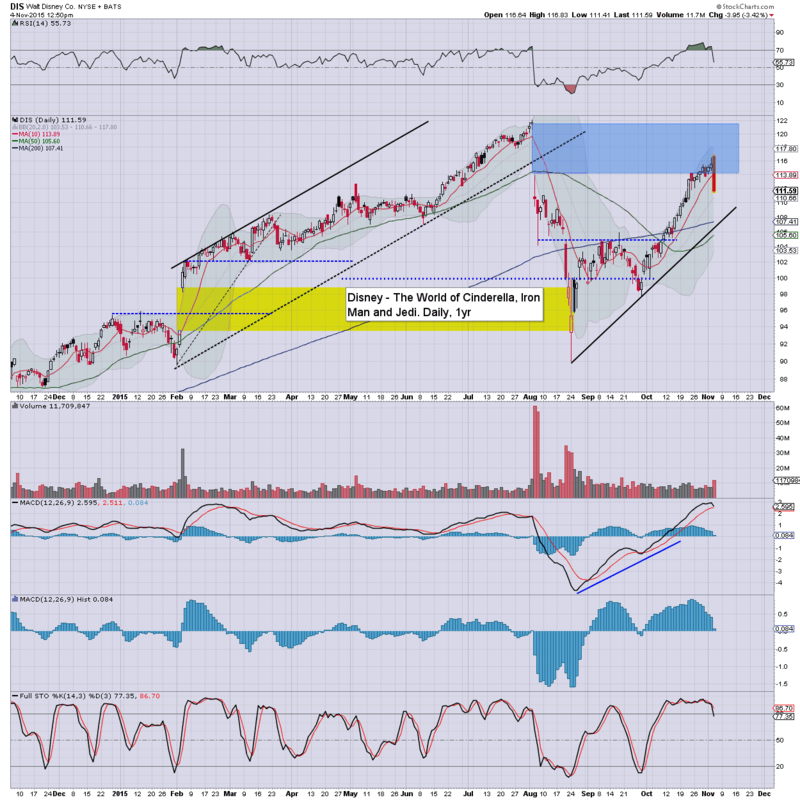 I am super bullish DIS (not least due to Marvel, and Star Wars).. but for now... the stock looks in real trouble... with earnings due tomorrow AH. As for VIX... its arguably a leading warning that the market is going to sell significantly lower this Friday. The 18/20 zone looks very reasonable. US equities are increasingly weak, with the sp' trading back under the 2100 threshold. First soft support is around 2090, and then the 200dma (2062). With a weekly oil surplus of 2.8 million barrels, Oil has lost all short term upside momentum, -2.5% in the $46s.. and that is not helping energy stocks... nor the broader market. There is a fair amount going on in the past few hours, not least in DIS... where there was a $0.5-0.75 million put spread trade, one that has seemingly spooked the stock itself. It would seem someone with a lot of money to risk is betting on a sig' drop at the Friday open.. with earnings due at the Thursday close. 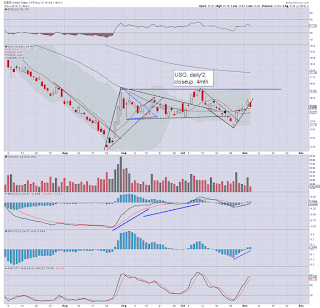 Right now, a move to the 108/105 zone looks very viable... even if earnings come in fine. As for the broader market... a daily close in the 2090s would be useful.. and open the door wide to a weekly close in the 2060/50s. 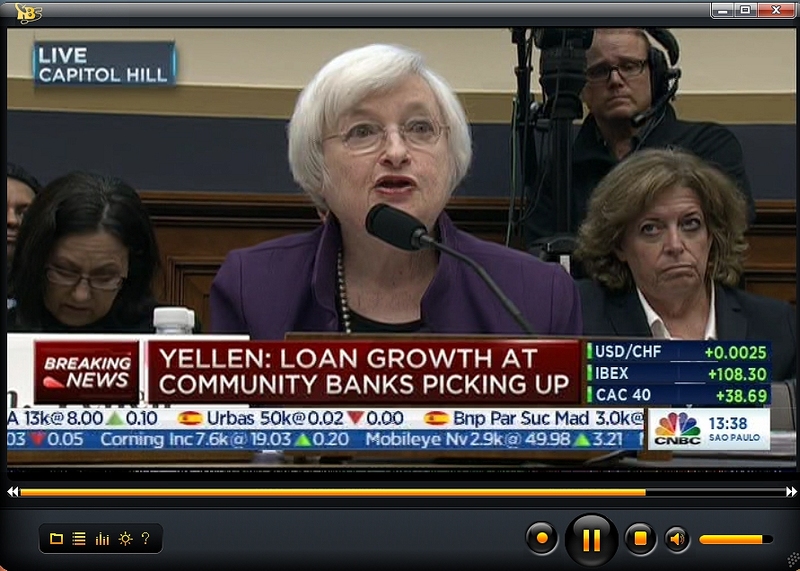 Whilst US equities remain moderately choppy, Yellen is facing the (generally) inane questions from members of the US congress. Mr Market is currently considering comments about a possible Dec' FOMC rate hike. 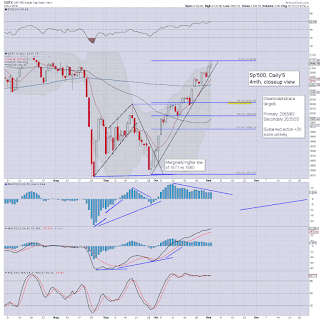 The probability of an equity retrace is increasing with each hour. Oil is notably weak on inventories, -1.7%. *VIX price structure is pretty good for the equity bears... still awaiting a clear break.. and then to 18/20... as early as this Friday.. if a straight fall to the 200dma. So... a bit of chop... but with Yellen starting to blabber about possible rate hikes at the Dec' FOMC, the market is cooling again. I sincerely hope the maniacs at PRINT HQ decide to deliver an early Christmas present to the financials... along with the rest of the economy. Of course.. some of you see a 25bps rate rise as the start of the end of the world. I merely refer anyone to an economics text book pre-2007. Not so great... grey gloom... at 10am EST.. an hour before nightfall. 11.30am.. 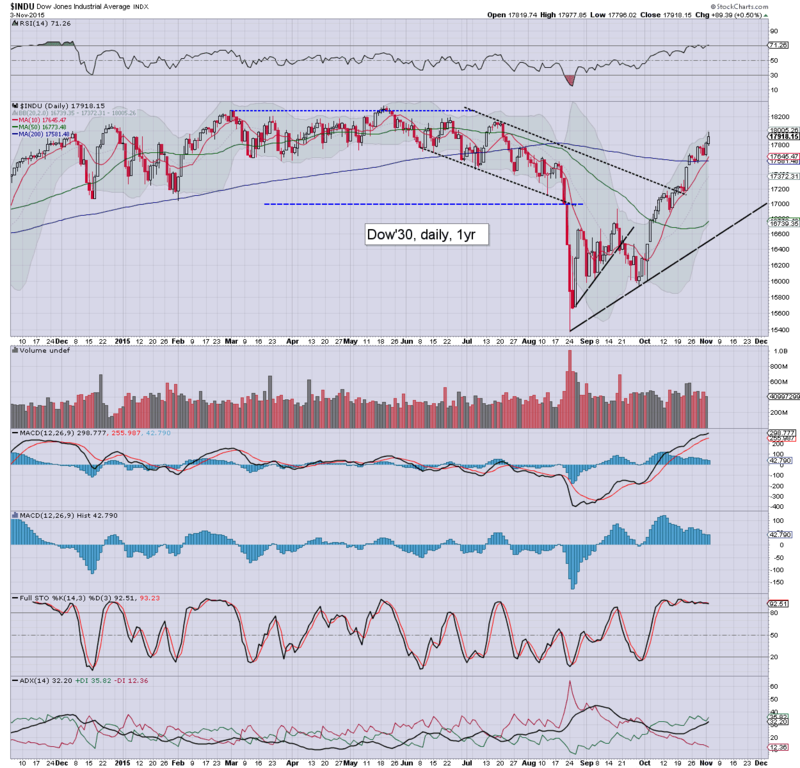 I see an option DIS trade... 10,000x of the Nov' 105s and 100s. So.. its a short term put spread costing around 0.5-0.75 million (hard to know what the actual put purchase price was) with just 12 trading days left on the detonator clock. 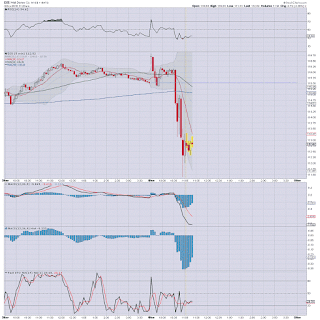 It would see that is what might have spooked the underlying stock. 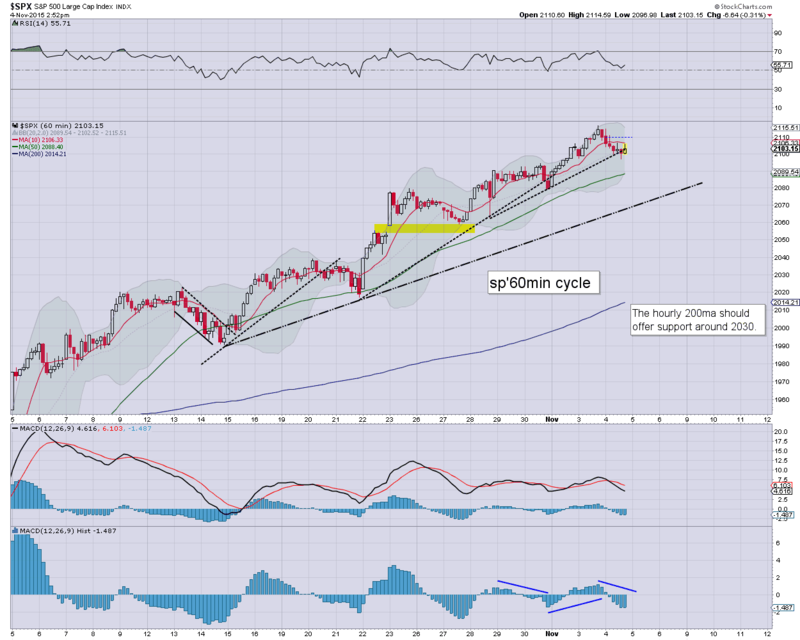 US equities open a little higher, but the gains have quickly evaporated, with a rather clear reversal. 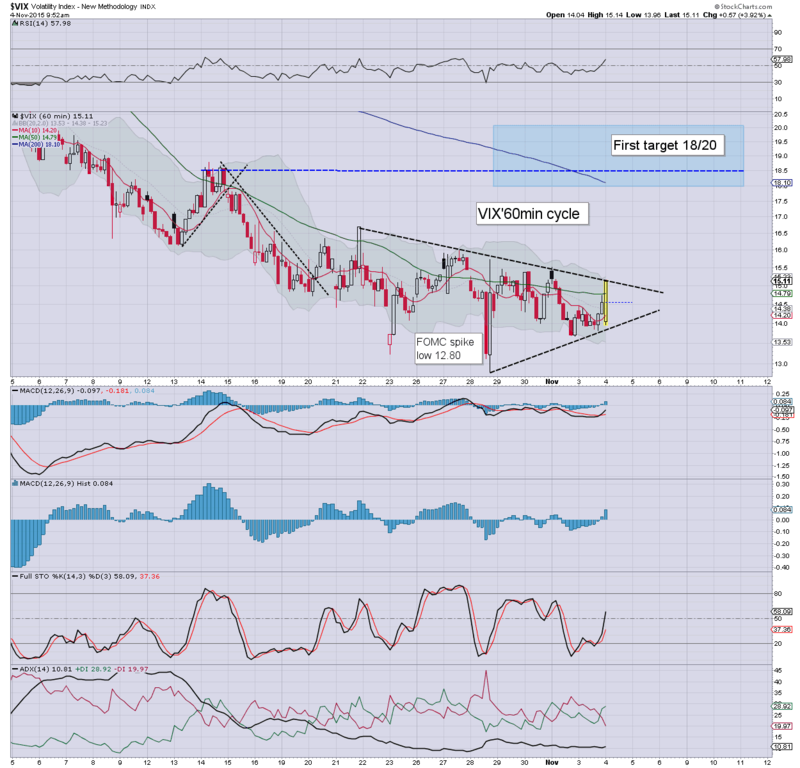 Cyclically, we're due a down cycle... first soft target is around sp'2090.. along with VIX 16.00. Metals are broadly flat. Oil has turned lower, -0.8%.. ahead of the next EIA report. A marginally interesting open, but for now... there is barely any downside power. Hell, even a move to 2090 later today would be little solace to those short from anywhere >2060. I'm still of the view that the market will NOT make new historic highs (in sp'500/Dow.. not other indexes.. which are lagging anyway).. before a retrace. Basic target remains 2065/60.. then 2025/20. *Yellen is due to speak to the US house... I'm unaware if that will get any live coverage. 10.36am.. Oil inventory surplus.. 2.8 million barrels.. less than last week, but still.. .a sig' surplus. Good morning. US equity futures are a touch higher, sp +2pts, we're set to open at 2111. 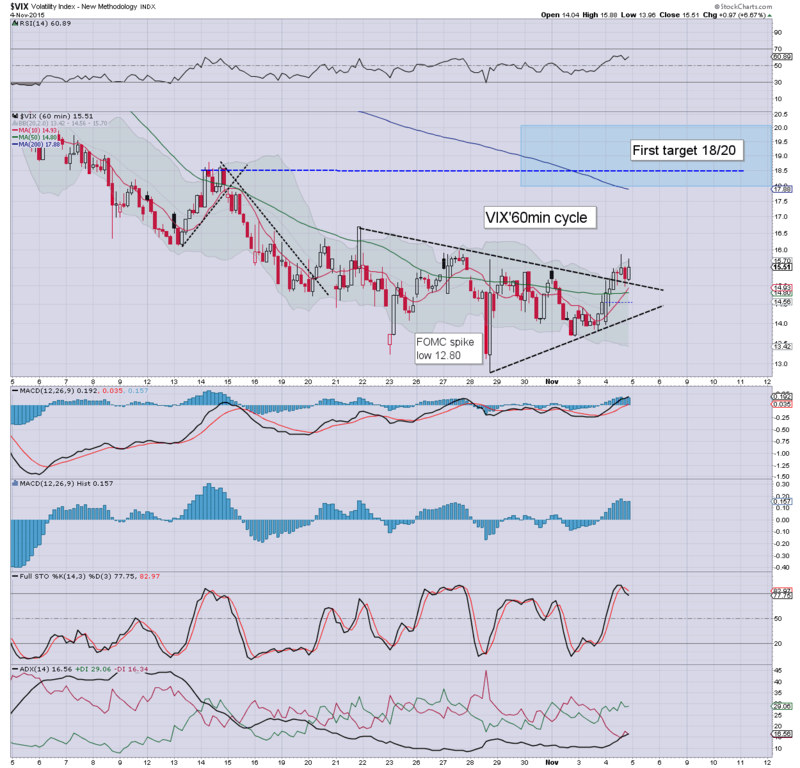 USD continues to claw higher, +0.2% in the DXY 97.30s. Metals are broadly flat, whilst Oil is +0.5% in the $48s... ahead of the latest EIA report. Short term trend remains bullish of course, but cyclically, we're now well into overbought territory. With the monthly jobs this Friday, Mr Market is going to have a perfect excuse to break lower... and begin the retrace I've been touting for some time. It should be clear to many though... the underlying upside power is rather extreme, and any retrace is not going to go much below 2020. TSLA +8% @ $225. which considering the earnings, 58 cent loss... is ludicrous. The stock should be trading <$200. As ever... make of that, what you will. *I do appreciate all comments... and especially emails! Always good to hear from some of you out there. 8.18am.. ADP jobs , 182k, not super bullish, but neither bearish. I guess some would even dare suggest 'Goldilocks'. 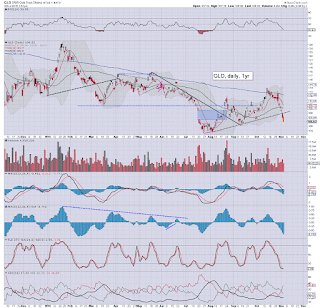 early strength: DIS +0.8% @ $116.50.... earnings tomorrow. It was just another day for the US equity market, breaking a new cycle high of 2116, a mere 18pts (0.9%) from the May high of 2134. It remains incredible to reflect upon the fact that the market has seen a hyper ramp of 245pts (13.1%) across just 26 trading days. Suffice to say.. a retrace remains due. Sustained action under the sp'2K threshold looks highly unlikely for the rest of the year.. and almost equally likely... first half of 2016. Wed' will ADP jobs, EIA report, PMI/ISM service sector, intl. trade. 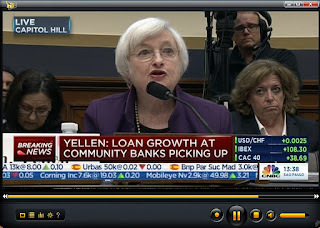 *amongst a number of fed officials set to speak... Yellen will appear before the US congress to talk about regulatory issues. 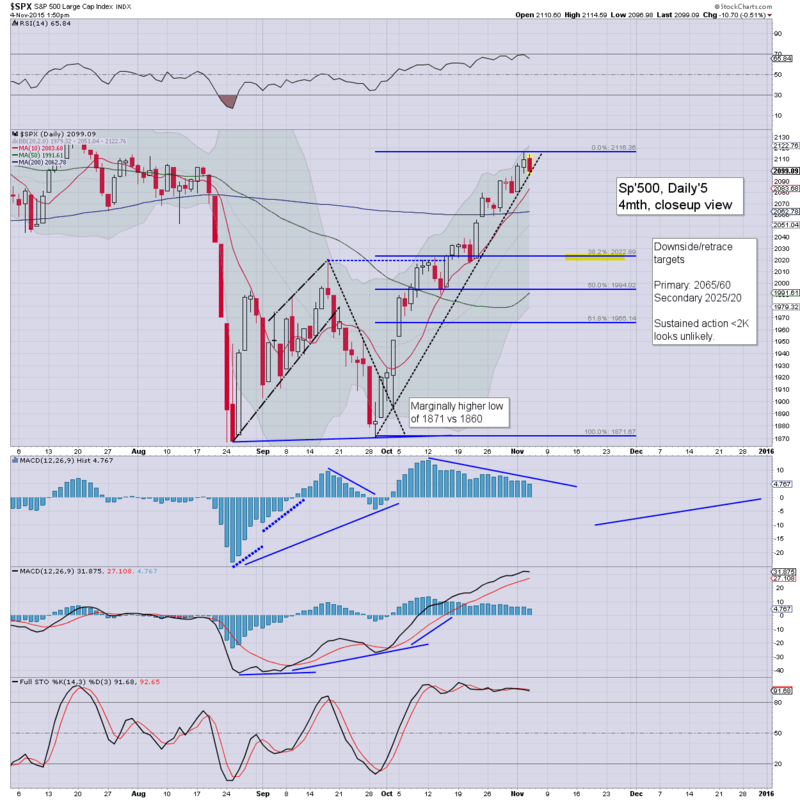 US equities closed moderately higher, sp +5pts @ 2109 (intra high 2116). The two leaders - Trans/R2K, settled -0.4% and +0.4% respectively. Near term outlook remains for a retrace, but with each extra point higher, the downside target is raised. First soft target is the 200dma in the 2060s, with secondary in the 2025/20 zone. Today's new cycle highs are rather extraordinary, with the sp' coming within 0.9% of a new historic high. 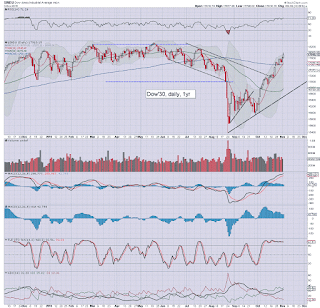 Even a retrace to the 50dma by Nov' opex would do absolutely nothing of significance to dent the current up wave. Broadly, the market looks set to climb into year end.. and across next spring.